Thank you for using the AWS Console mobile app. We are continuously working to improve the user experience and add functionality. Please use the in-app feedback to provide insights, report bugs or make feature requests - we're listening! This update fixes several issues and improves app stability. 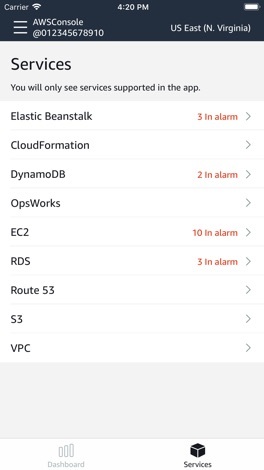 The AWS Console Mobile Application, provided by Amazon Web Services, lets customers view and manage resources to support incident response while on-the-go. 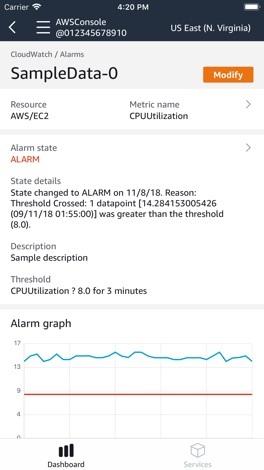 The Console Mobile Application allows AWS customers to monitor resources through a dedicated dashboard and view configuration details, metrics, and alarms for select AWS services. 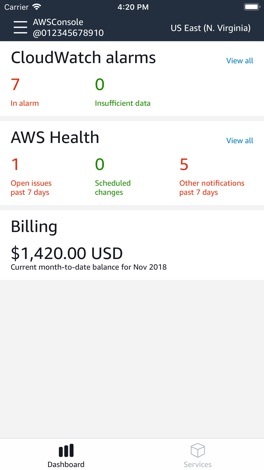 The Dashboard provides permitted users with a single view of a resource's status, with real-time data on Amazon CloudWatch, AWS Personal Health Dashboard, and AWS Billing and Cost Management. 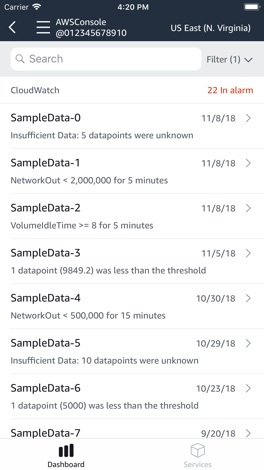 Customers can view ongoing issues and follow through to the relevant CloudWatch alarm screen for a detailed view with graphs and configuration options. 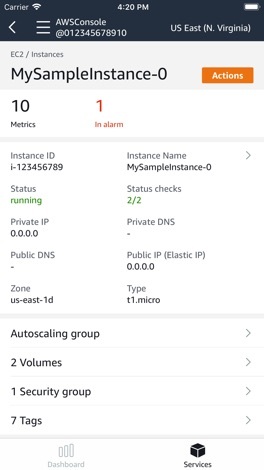 In addition, customers can check on the status of specific AWS services, view detailed resource screens, and perform select actions. 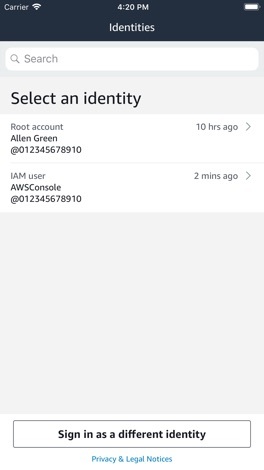 The Console Mobile Application requires an existing AWS account. Upon initial setup, the Console Mobile Application lets you stay signed in to multiple identities at once. Login process leverages biometrics authentication (on supported devices), making access to AWS resources a simple and quick. 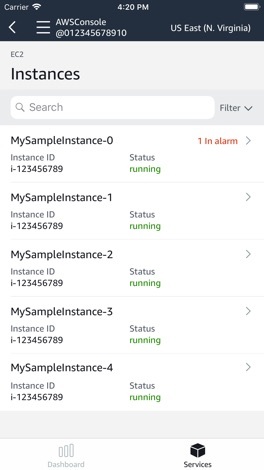 The Console Mobile Application supports AWS Billing and Cost Management, AWS CloudFormation, Amazon CloudWatch, Amazon DynamoDB, AWS Elastic Beanstalk, Amazon Elastic Compute Cloud (Amazon EC2), Elastic Load Balancing, AWS OpsWorks, AWS Personal Health Dashboard, Amazon Relational Database Service (Amazon RDS), Amazon Route 53, Amazon Simple Storage Service (Amazon S3), Amazon Virtual Private Cloud (Amazon VPC). The Console Mobile Application supports US East (N. Virginia), US East (Ohio), US West (N. California), US West (Oregon), Asia Pacific (Mumbai), Asia Pacific (Seoul), Asia Pacific (Singapore), Asia Pacific (Sydney), Asia Pacific (Tokyo), Canada (Central), EU (Frankfurt), EU (Ireland), EU (London), EU (Paris). We regularly release updates with new features. Tell us what features you need and how you would use them with the Feedback link in the Console Mobile Application's menu. We're listening!